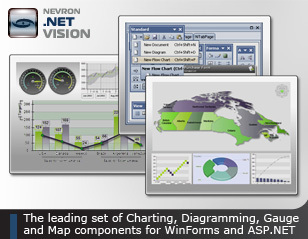 Nevron .NET Vision is the leading suite of WinForms and ASP.NET components that help you create enterprise grade digital dashboards, scorecards, diagrams, maps, MMI interfaces and much more. The carefully designed object model and presentation quality make the .NET Vision suite indispensable for any Business Intelligence, Scientific, Presentation, Financial or Statistical data visualization project. Nevron Chart for .NET has been designed from the ground up to be extensible, efficient and feature rich.This allows it to wrap a vast amount of features in an intuitive and straightforward programming model. The component can display virtually any 2D or 3D chart including: Bar, Line, Step Line, Area, Pie, Point, Bubble, Stock, Floating Bar, Radar, Polar, High Low, Mesh Surface, Grid Surface, Shape, Smooth Line, Float Bar, Venn and Error with many variations (like Scatter XY and XYZ Line, Stacked Bars etc.). 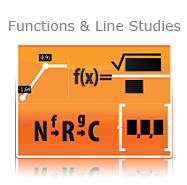 Nevron Diagram for .NET - the smart way to extend your WinForms and ASP.NET applications with interactive displays of graphs, flowcharts, networks, maps, UML and general purpose diagrams. It is a complete diagramming solution, packed with many interactivity features, shapes, automatic layouts, stunning visual effects and comes equipped with ready to use controls to help you boost your application development. Carefully crafted to meet different requirements and specific business needs, it provides unmatched extensibility options, which will help you to integrate the solution better into the context of your particular project. Nevron User Interface for .NET is the only suite on the market with such remarkable render quality and speed. Explore a rich and powerful docking library, professional and extensible command bars and unique features like skinnable forms, rich-text labels, modern fill effects (glass, gel), designed to bring to your .NET applications the latest GUI standards and technologies. The suite introduces lots of modern custom controls such as MS Outlook 2003 Navigation Pane, Windows XP Explorer Bar and a complete set of extended Windows Forms controls, making it easy to create a distinguished, stylish and modern end-user presentation layer.